Blues Blast Magazine - www.TheBluesBlast.com - Blues CD Review. Boogie woogie piano was quite the rage in the 1930's and the interest didn't wane until the following decade. There have been some mini-revivals in the years since then led by musicians like Commander Cody and Mitch Woods. Add to that list Otmar Binder, a German piano player who has fallen for the allure of the music's driving beat. Boogie woogie tunes often favor rapid tempos that can prove challenging for those blessed with less than the fleetest of fingers. Binder and his bandmates, Alexander Lackner on bass and Michael Strasser on drums, quickly demonstrate their talents. After Lackner opens the proceedings with a brief solo, Binder digs into “Homerun”, his fingers rolling up and down the keyboard over the solid mid-tempo rhythm. The other straight trio track, “All the Way”, takes a minute to settle into the familiar pattern as Binder offers some subtle variations on the standard progressions. 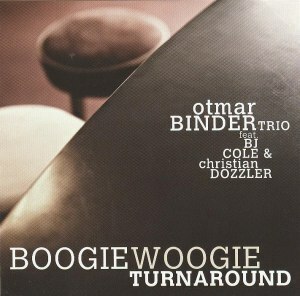 Binder shares the spotlight with fellow pianist Christian Dozzler on five cuts . Binder's strong left hand powers “Steamin' Away” with Dozzler accompanying him on harmonica. The pace slows on ”Bluesprint” as the two keyboard aces engage in a savory duet. They follow that up with another easy-rolling dialogue on “Travelin' “ while “Uphill” pleases with a jaunty approach. For his final appearance, Dozzler blows a robust, unaccompanied harp solo on “Sugar Cane”. Guitarist BJ Cole makes his presence known on “Rising River Boogie”, his pedal steel giving the cut a country feel while Binder drops several inventive runs into the mix. Oliver Gattringer takes over the drums on “Looking Forward” and his forceful style elicits an energized response from Binder. The leader's spell-binding efforts on Brighton to Boston” are answered by mournful tones from Cole's steel guitar. “Common Ground” is a toe-tapper with hardy contributions from both men. The last two tracks, Venice Stomp” and “Floyd's Turn” slip back into the mid-tempo mode with the letter cut enhanced by a three piece string section and a vocal chorus. The musical fireworks are plentiful on “At Last” as Binder engages Charlie Furthner in rousing cutting contest that ends in a draw. Geri Schuller's organ brings a warm gospel feel to “Changes To Be Made”, another highlight with Binder showing the enormous depth of emotion he can draw from his instrument. Despite using a variety of recording studios, there is a consistent sound from track to track. You will really appreciate the exquisite sound quality, especially on the piano duets where you can clearly distinguish what each of the four hands is playing. The lone shortcoming on the all-original program is that Binder never really cuts loose at a blinding tempo. It seems an odd omission as he clearly has the chops to play at a faster pace. All in all, this one is a burnished rendering of a musical style that refuses to fade away and Otmar Binder's jubilant playing makes it worth checking out..